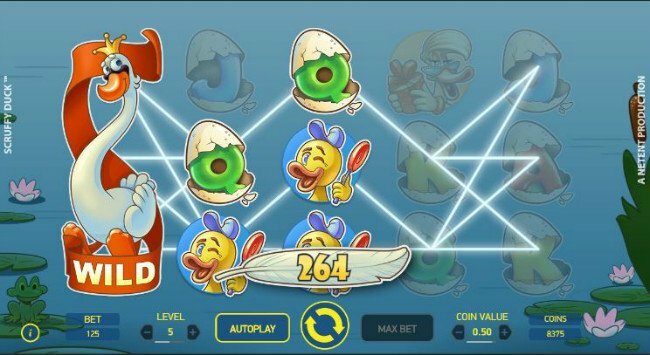 NetEnt have produced a fantastic little slot with their Scruffy Duck slot game. Free spins, bonus games and a broad wagering range makes this a fun video slot. There is something incredibly familiar about the Scruffy Duck slot machine. As soon as you open the game up and start to mess around with the special symbols, you will see what it is. Yes, Net Entertainment’s Scruffy Duck slot game is loosely based on Hans Christian Andersen’s The Ugly Duckling. As we dive into our Scruffy Duck slot review, the similarities will become all too apparent. The Scruffy Duck slot graphics don’t necessarily give the game away. They feature a modern duck family, and it is only when you get to the special symbols and features that it becomes clear that the Scruffy Duck slot is based on that famous children’s tale. The imagery in the base game is cute and cuddly, and is child friendly, if only children could play online slots. 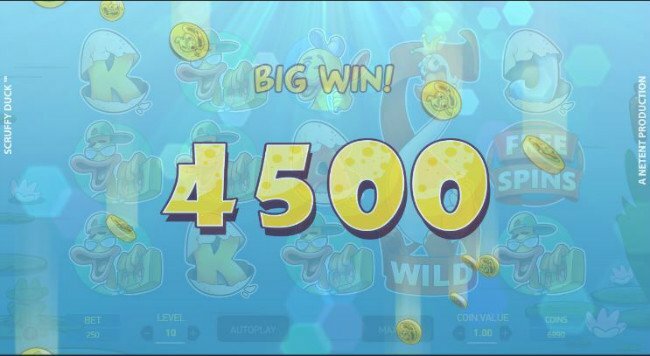 Waddling into the wagering menu bar next, one can see that the Scruffy Duck video slot allows you to choose coin values which range from 0.01 up to 1.00, and you are at liberty to bet up to 10 of those coins per line. Wagers range from a floor of 0.25 per spin, up to a ceiling of 250.00 per spin on this 5-reel, 25-line, non-progressive slot. The expanding wild symbol is the icon which gives the theme of this slot away. It starts off as a single duck icon, but when it expands it turns into a beautiful swan. Wilds can substitute for all other icons save for free spin symbols and have no winnings of their own to offer players. Free spin symbols aren’t hard to miss. They appear as “free spin” words surrounded by a circular frame. These symbols can trigger a bonus round when they appear 3, 4, or 5 times in any positions on the reels during a single base game spin. There is no shortage of Scruffy Duck slot bonuses in the free spins feature. Players can opt to play with 15 free spins with a 3x multiplier, 12 free spins with the lowest paying symbols removed from the reels, or 10 free spins with a colossal swan wild appearing on the reels. 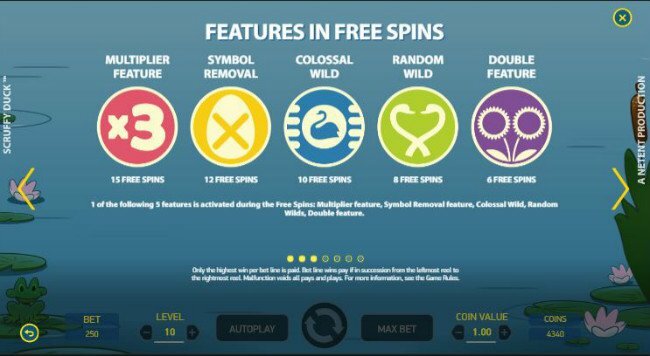 Other options include 8 free spins with random wilds and just 6 free spins with a double symbol (split symbol) feature. NetEnt have produced a fantastic little slot with their Scruffy Duck slot game. It is the second major fairy-tale/children’s nursery rhyme themed game in six months, following on from Fairytale Legends: Red Riding Hood. The game is in the same vein, too, and this could be the makings of a franchise that we are seeing from the Scandinavian online casino software provider.